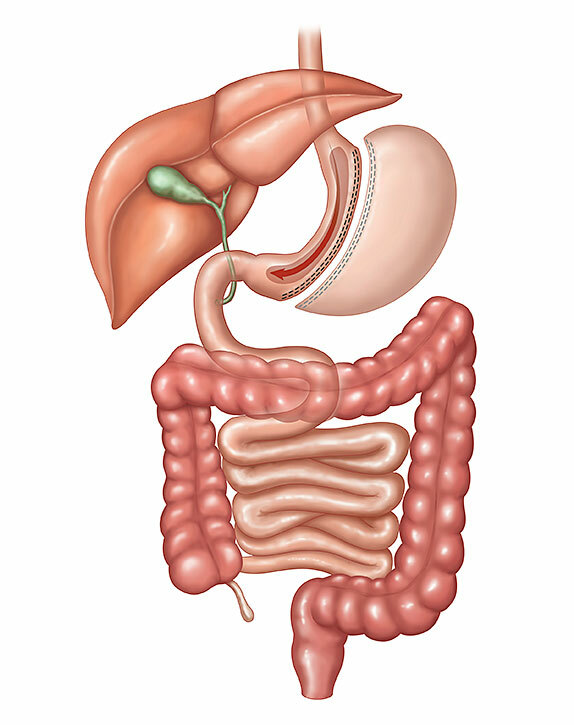 The Laparoscopic Sleeve Gastrectomy -often called the sleeve- — is performed by removing 80% of the stomach. The remaining stomach is about the size of a banana (in length and circumference). The sleeve works to help you lose weight by two primary and interacting benefits: Restriction and Metabolic Changes. Restriction: Similar to RYGB, the new stomach sleeve holds a much smaller amount of food compared to before surgery. This helps to significantly reduce the amount of food (and this calories) that can be consumed. Metabolic Changes: Also similar to RYGB, the greater impact of the sleeve seems to be the effect the surgery has on gut hormones that impact a number of factors including hunger, satiety, and blood sugar control. Short term studies show that the sleeve is as effective as the RYGB in terms of weight loss and improvement or remission of diabetes. There is also evidence that suggest the sleeve, similar to the gastric bypass, is effective in improving type 2 diabetes independent of the weight loss. 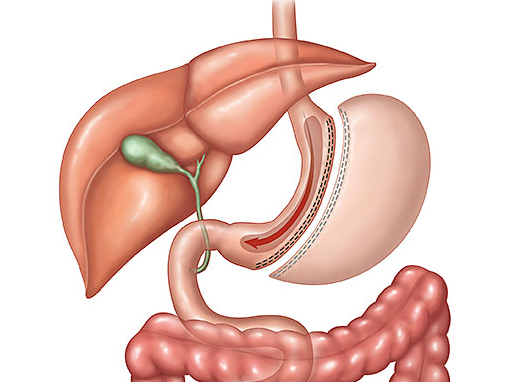 What are the advantages and disadvantages of the Laparoscopic Sleeve Gastrectomy? Generally about one hour, similar to a gastric band and shorter than the RYGB. The average length of time in the hospital is one overnight stay. However, on a case-by-case basis, a person may be discharged later the same day of the surgery. Same-day discharge is never a spontaneous decision. The discussion about same-day discharge begins between the surgeon and the patient before surgery ever happens and is re-evaluated on the day of surgery during the post-operative hours after surgery. The expected weight loss is about 60% of excess body weight, slightly less than the gastric bypass.